Time to share our first impressions from printing with the new Innofil3D EPR PET 3D printer filament that we told you about last month. The recommended print temperature of the Innofil3D EPR PET filament is somewhere in between 200 and 230 degrees Celsius, so we have tested in that whole range to see what will be the results. The printing speeds that are recommended are between 40 and 100 mm/s and we had no trouble printing at the highest point with smaller details and higher resolution. The EPR PET filament should be printable without heated build platform, but if HBP is available the recommended temperature to use is between 75 and 85 degrees Celsius. We were able to print 3D models just fine without turning on the heated build plate of the printer, though the use of HBP might help prevent warping of edges when doing large and more complex prints the same way as with PLA. 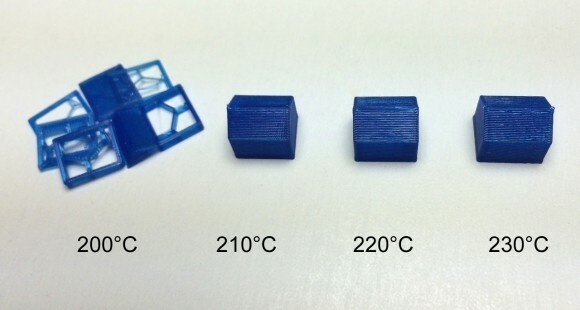 The glass transition temperature of the ERP PET material is listed as 62 degrees Celsius or maybe slightly higher than the 55 degrees of an average PLA, though some PLA filaments may go as high as up to about 65. This is the temperature when the material starts to soften, so similar to PLA this filament is also not suitable for use when high ambient temperatures are expected. We are using our trustworthy MakerBot Replicator 2 3D printer for printing and are doing our typical test using a simple 3D model of a house (Monopoly style) printed at various extruder temperatures with 0.2 mm layer height as well as printing a 1×1 cm cube with 0.1 mm layer height to compare the accuracy of the printed part to that of the same model printed from PLA. 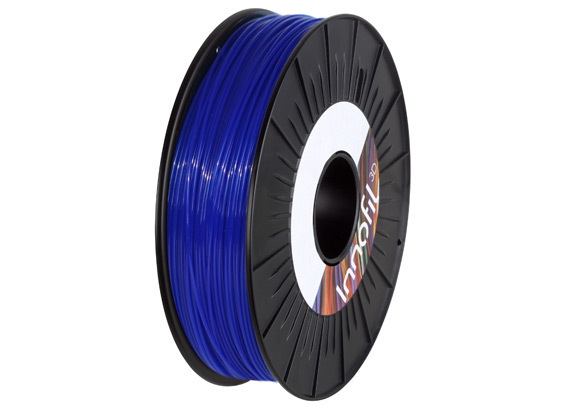 Innofil3D is positioning the EPR PET filament as an alternative to the most common PLA filament for 3D printers and although they are pretty similar in terms of specifications. Though Innofil3D notes that there might be some areas where their new filament could perform slightly better than normal PLA making the EPR PET an easier to print material and with better resulting prints. What you can see on the image above is the results we got from our simple house test prints using various temperatures of the extruder. At 200 degrees Celsius the house did not print like that, but it seems that the temperature is too low for proper interlayer adhesion, so while we were removing the house from the printer build platform it started to cleanly break at various layers. At temperature of 210 degrees Celsius there were no longer any problems with interlayer adhesion like with the lower temperature and the best quality results we got were in between 210 and 215 degrees. Going with temperature of 220 degrees Celsius and higher the resulting 3D prints were still very good, but visually they had some small imperfections compared to the result we got at about 210-215. So for best quality and to avoid interlayer adhesion issues the 210-215 degrees Celsius seems to be working best with the Innofil3D EPR PET filament, at least for us on our Replicator 2 3D printer. The other test for the shrinkage of the material after printing has shown that the ERP PET 3D filament has very minimal shrinking just like PLA does, so that makes it suitable for more accurate prints and less problematic in terms of possible warping unlike when using ABS for example. What is our conclusion about the ERP PET 3D printer filament after doing some test prints with it, well we consider it as a very good alternative to traditional PLA filament. It has very similar properties and ease of use, provides very good printing quality and even has some advantages. It prints well at higher extrusion speeds for smaller details, but good PLA does that as well, in terms of resolution and appearance it performs like a good PLA filament and probably better than cheaper PLA filaments. There is a bit of a catch however in terms of good layer adhesion and good quality, you need to use the right printing temperature to get these, if you don’t then you may end up with worse results than with PLA. The best working temperature for ERP PET seems to be a bit lower than what we are used to working with with most PLA filaments, that is if you really want to get the best quality and avoid problems with layer adhesion, but don’t go too low either. In terms of strength the ERP PET filament has some advantage over PLA, though it may not be as strong as material as ABS for example and with a price that is just slightly higher than that of normal PLA the Innofil3D EPR PET filament could really end up being an interesting alternative to traditional PLA filaments. Innofil3D, a company specialized in making 3D printer filaments has released a newly developed filament called ERP PET that promised better results and features than traditional PLA filaments and the new ERP PET should come at a similar or slightly higher price point. PET (Polyethylene Terephthalate) is well known for its wide application in making plastic bottles and it has great characteristics to bring 3D-printing to the next level. 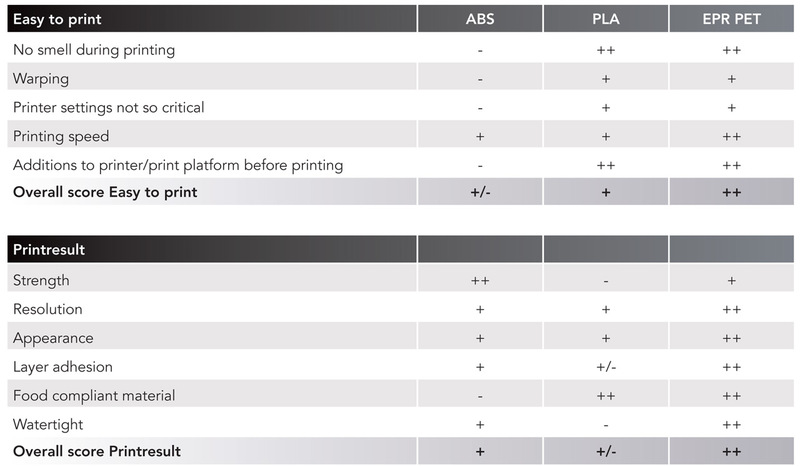 Currently PLA and ABS are the most common used monofilaments for 3D-printing. PLA is nice for consumers, but printed objects have their limits. ABS gives great results but users can experience difficulties when using it on their printer and most people dislike the smell during printing and it is not healthy to breath the fumes. So here comes EPR PET promising to be a a great alternative for both, a new PET-based filament specifically designed for 3D printing from Innofil3D. It is easy to use, doesn’t generate fumes, shows great detail and is recyclable. EPR PET has a larger operating window for printing (temperature vs. speed) so it can be used on every 3D-printer and there should be no need for a heated bed since EPR PET adheres very well on tape. 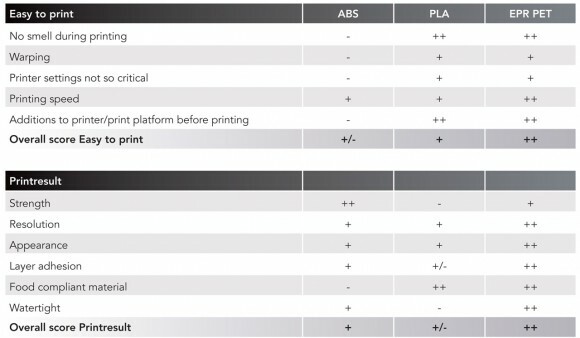 According to Innofil3D their ERP PET filament should be as easy to print as PLA and the resulting print should be better in terms of Strength, Resolution and Appearance thus making it a great alternative to standard PLA and allowing users to use the new filament for things where PLA may not be good enough. The glass transition temperature of the ERP PET filament is listed at 62 degrees Celsius or with other words the thermal resistance is similar to that of standard PLA where normally that temperature is about 55-60 degrees Celsius. We have a spool of the new ERP PET filament from Innofil3D to try out the new material, so we are going to be sharing our feedback from using it and how it compares to PLA very soon.